Our complex food system presents us with a knot of issues so tangled that they can be difficult to define, let alone resolve. A solution to one issue may evolve and create problems around another. 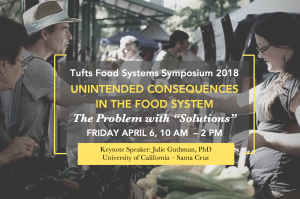 The 2018 Tufts Food System Symposium tackles the issue of unintended consequences and asks how we can continue to work toward a more resilient food system when we can’t reliably foresee what the longer-term results of our actions might be. Effective food systems policy and planning requires broad considerations ranging from ecology to social justice on both a local and global scale. We will bring together policy experts, food justice advocates, and practitioners in the field to discuss past lessons learned and explore what kinds of collaborations and approaches allow for a greater understanding of change in our food system. Subscribe to our mailing list to receive updates about the symposium. The event is organized by a committee of undergraduate and graduate students, staff, and faculty from the Department of Anthropology, the Environmental Studies Program, Friedman School of Nutrition Science & Policy, Tisch College of Civic Life, and Tufts Dining. Click here to be added to the mailing list for updates about the next symposium. Copyright © 2019 Food[at]Tufts. All rights reserved.